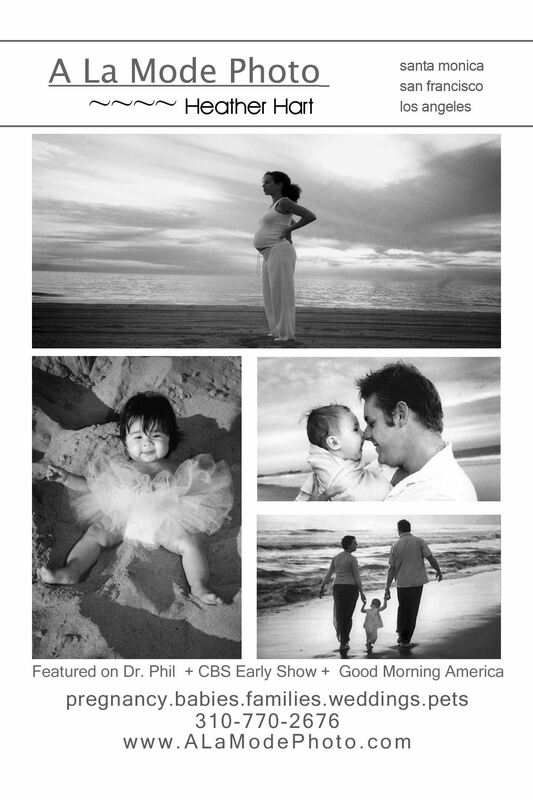 Whether you want pregnancy pictures now or baby and family pictures later, A La Mode Photo is the place for you! Because Heather Hart shoots outdoors, the natural environement takes over and she will make you look and feel beautiful! Heather prefers shooting at the beach and at local parks rather than in-studio photography so that her clients can receive a variety of shots and poses. As it's been explained to us, "nature takes over and you and the scenery automatically look stunning....you feel calmed from the ocean waves crashing and you relax." Recently on Good Morning America and CBS' The Early Show, we don't need to convince you here, check out her portfolio on her website. We love A La Mode Photo because she prioritizes her clients and makes them feel like they are the "star" for the day. She shoots lots of film, takes her time with her clients, provides them with a location shoot, and encourages wardrobe changes - for maternity shoots, Heather brings different form-fitting fabric to wrap you in which takes on a different form for each of her Big Bellied clients. What more can you ask for in someone to commemorate this most joyous time in your life? Call A La Mode Photo today and tell her that we sent ya! (mention LAPregnancy.com for a free gift with your photo shoot). And don't forget to bring your family and friends... she'll be happy to incorporate them for free!